The ferry rides are spectacular. On the first one, a 30 minute ride from the mainland to the southern tip of Whidbey Island, the sun rises behind us as we disappear into the frosty sub-freezing fog that obscures the island from us. Once on Whidbey we drive the small two-lane until we hit a diner. The sidewalks are dotted with kids headed to school, all of them bundled up in layers, not a serious winter coat anywhere. I have trouble with the ketchup bottle and drown the poor hash browns, but otherwise the food is warm and wonderful. The next ferry takes us off Whidbey Island, through a small strait, right to the attractively-arrayed town of Port Townsend. Even from a distance, I can see pretty white houses and buildings scattered over the hills. It's almost enough to make you miss the towering range of Olympic Mountains behind the town. Once in Port Townsend, we do some banking, check a few antique stores out and then my wife drops me at the white clapboard building that is Copper Canyon. Sam greets me and we get down to business quickly. On the wall facing him is a monumental stack of books published by his esteemed press over the past 30 years. It's a little daunting. I spot on the spines some of the names of poets I've already seen on the trip. It's probably not necessary to mention it, because it's mostly well known in the poetry community, but Sam's world has been buzzing this past year. In January he was invited to the White House to take part in a symposium on American poety sponsored by Laura Bush. But when the war in Iraq began, Sam organized Poets Against the War instead, a 21st century version of the earlier Vietnam-era model. Many of the most important and influential poets in the country got involved in a wide range of readings and publications. The project would tax anyone, but as Sam correctly notes, it's generated some of the most important public discussion in decades. But we're here today to discuss other things. Sam answers everything directly without hesitation. He's sure of himself. It's a sort of confidence, I think, that comes with his comfort level. He's lived in Port Towsend for 30+ years; he's run the press for the same amount of time. He's a grown up. After we chat, we shoot some photos in the building, some in his office and some in an airy room that contains - what I imagine is - Copper Canyon's original press. In the photos, Sam looks right at the camera. In other situations, the interviewee sometimes wants to know what to do. What should I look at? Is this okay? Should I sit? Sam just knows. 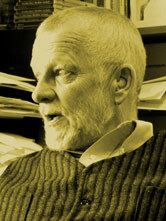 He looks right at me, his eyes open, clear, and I shoot fast; Sam Hamill is a guy who's got a full day ahead. The day doesn't stand a chance. After fish and chips at the Dry Star Cafe, we head south out of Port Townsend. We curl around a series of highways until we end up in Bainbridge Island, a little burg that sits aside one of many ferries back to Seattle.